By the time the United States entered the war in 1942, several American women had already been on the scene in Europe for years: Dorothy Thompson, Sigrid Schultz, and Helen Kirkpatrick. Both Thompson (1924) and Schultz (1926) became Berlin bureau chiefs of competing newspapers. Later, Kirkpatrick became London bureau chief for the Chicago Daily News in 1939. 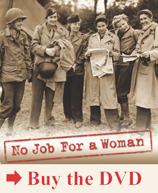 They all had the ambition and imagination to take advantage of conditions that at the time made it possible for women to enter into these positions: first was the volatile political climate of central Europe in the 20’s and 30’s; secondly, the profession of foreign correspondent was a fairly recent development; and thirdly, as a result, there was not the prestige and perks that would normally lure men. From this beginning, they became the reining Grande Dames of foreign reporting before the war broke out. Indeed, they have been called the “Cassandra’s of the Coming Storm” for their prescience, backed up by incisive analysis and impressive reporting based on the top-level access they all cultivated.